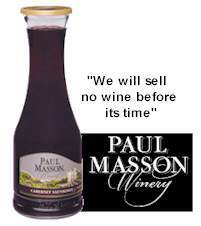 “We will sell no wine before its time.” That was the slogan of a famous Paul Masson winery advertising campaign. (See note at the end of this post.) But a lot of wine is sold before it has reached its peak. And that’s a problem for both consumers and producers. Immature wine is sort of like the flat-pack furniture they sell at Ikea — all the pieces are there, it is up to the consumer to take them home and complete assembly. Wine buyers are supposed to take immature but age-worthy wine home, stash it under the stairs or in a climate-controlled wine storage appliance, and remember to bring it out when the time is right. Unfortunately there are a lot of differences between fine wine and a flat-pack antique finish Ikea Aspelund bedside table. I suspect that most people knock together their Ikea products soon after purchase, so they know pretty quickly if all the pieces fit. Disappointment, if there is any, is soon realized and resolved. Wine is a different situation completely. You can’t tell if a bottle of wine is sound (uncorked, untainted) just be looking at it. Every type of closure system has its flaws, as George Taber has explained. So aging wine is a kind of crap shoot. Even a professional can’t be sure that the wine cellar is full of good wine getting better or bad wine fading to oblivion. Each bottle is a mystery until opened. Not that this always matters: most wine produced in the world today isn’t really designed with cellar aging in mind. Why do wineries sell immature wine and leave it to amateurs like me to age it? Why don’t they store it properly and release it at or near its peak? The answer, of course, is that time is money. Few wineries can completely ignore the economic cost of holding their wines in bottle or barrel until they are mature. The incentive to market what I have called Chateau Cash Flow is very strong. The result is that most wineries intentionally produce wines that are ready to drink when still quite young. I find nothing wrong with this when done well. Others sell their wine before its time and cross their fingers — hoping (often in vain) that consumers will delay consumption until the wine has more fully matured. One consequence of this practice is the frequent disappointment consumers experience with fine wines, especially in restaurants. Some restaurants can afford to age rare and unusual wines and serve them at their peak. Most, however, find it necessary to sell them quickly, to produce that cash flow, with sometimes unfortunate results. It isn’t that these wines are bad, it is only that they are expensive (because of restaurant mark-ups) and often disappointing (because they years away from full maturity). The cost of money is often the root of the problem — wineries and restaurants find it too expensive to properly age fine wines. Money is nearly free today, however — if you can get it. It is the limited availability of credit that is the current constraint. I suspect that we will see lots of product pushed into the wine value chain, using cash flow to compensate for the lack of available credit. This fact promises opportunity for the few and likely disappointment for the many. Amateurs like me tend to be too patient (imagine that!) and let fine wine sit in the cellar too long. How can we avoid the curse of letting our best wines creep over the hill? Dorothy J. Gaiter and John Brecher, the wine critics at the Wall Street Journal, have an answer. For the last ten years they have been promoting Open That Bottle Night (it’s on Saturday 28 February this year). OTBN is an excuse to break out those special bottles and drink them before they fade away. It isn’t a systematic solution to the problem of time and money, but it is a reasonable personal response. I encourage my readers to celebrate OTBN this year. Wineries may sell wine before its time — and many of us may drink them either way too soon or well past their prime — but there is no reason not to try to break this pattern. Here is one of the original Paul Masson “sell no wine” commercials, featuring celebrity spokesman Orson Wells. Here is an out-take, with an obviously inebriated Wells reading the lines. « How Many AVAs are Enough?